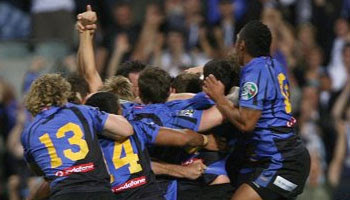 Italy beat Wales 23-20 in this years Six Nations at the Stadio Flaminio. A great victory for the Italians, but overshadowed by a terrible refereeing decision at the end. Wales were awarded a penalty, having checked with White that there was time for them to kick for touch and go for a match-winning try, they turned down the chance to go for the three points that might have earned them a draw. When Wales did kick for touch White immediately blew for full-time leaving the Wales players angry and frustrated. White was at least man enough to issue an apology for the confusion though. 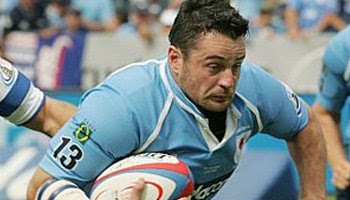 The Italian halfback Alessandro Troncon had no sympathy for the Wales players, blaming them for taking too long deciding what to do. He said: "Wales had 10 seconds left to play but the referee was correct because the Welsh players were talking about what to do and they took their time. Fortunately for us the official correctly decided to blow the final whistle." Six Nations 2007, Jonny & Jason are back, and England produce some fantastic hands to score in the corner. A great dummy and finish by Robinson in the end. Wilkinson missed the conversion, but had a great day besides that. After all the time off, he looks like he's back, and back to form more importantly. Imagine picking up a loose ball, stepping some guys and making a great run to the line, then diving over only to lose the ball unchallenged. Odwa Odungane did it a few weeks ago. Maybe this guy was his inspiration? This video has done the rounds on the internet, but I've added my own twist to it.. It's just not the same without the music and replays. Enjoy this legend in action. 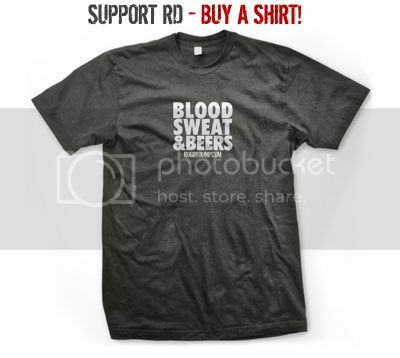 This weekend the much anticipated return of the rested All Blacks should bring with it some interesting results. A lot is expected, but will the pressure be too much, or will the guys who were filling their shoes so well end up getting recalled and being the new stars? Time will tell. All I can say is, those Sharks flasher girls get better every week. I'll be down there for the weekend of the 28th, and I reckon binoculars will be the order of the day. Also, some killer Percy's and massive hits this week. Enjoy. Phillip Burger is a showoff. There's no doubt about it. Before last years Currie Cup, he was an absolute nobody. A talented Sevens player who would sometimes start on the bench for the Cheetahs. Until he started doing this ridiculous dive. Now, he's getting noticed. Amazingly, and to give him some credit, he's started showing some excellent form to go with that huge ego of his. On the weekend he came out with a ridiculous hairstyle that I'd rather not talk about. 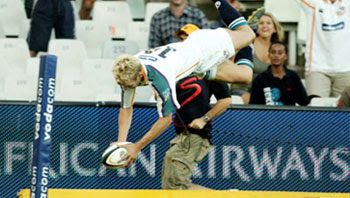 Check out the way he scored this try though. The boy definitly likes the attention. 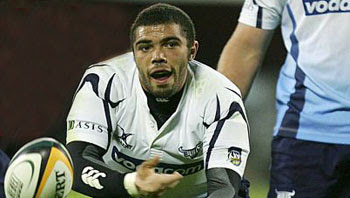 The debate regarding Bryan Habana rages on. Some say he's the quickest, best finisher in world rugby. Others say all he can do is run straight but doesn't have much skill. There's truth in both sides of the argument, but one thing for sure if that with a little space, and ball in hand he's absolutely lethal. There's not many who would ever out-run him. Brett Stapleton, Tonderai Chavanga, and Tom Varndell are supposedly quicker than him, but what have they achieved to date? Morgan Turinui was picked at wing up against Habana in this match. Big mistake. He was made to look like a front rower. Then again, three of the other backline players were also shown up. Great tries and skill from Habana, even managing to score when the hefty Turinui tried to shoulder him out the way. Another brilliant instalment of Try Savers & Rib Breakers. This edition features an old Guns & Roses classic. Look out for some brilliant big hits from this years Super 14, Six Nations and of course, some classic hits and try saving tackles from the past. Round 6 of the Super 14 brought with it another milestone performance. This time by the Force from Perth. More highlights of that here. 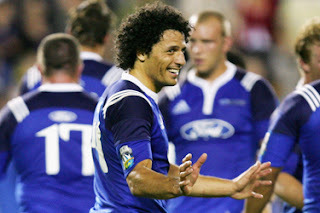 I have to give a big mention to Doug Howlett though after his performance for the Blues. Inspiring stuff, and Earl Rose will know better than to go messing with him again. Perhaps they were comparing Afros and Howlett took it the wrong way, exacting revenge by nailing Rose not once, but twice. The second one shown here is a classic. A week after the Sharks did the impossible to score with time up against the Crusaders at Kingspark, the Force pulled off another of this years amazing escapes to beat the Hurricanes in the dying seconds. It was the first win at home for the Force in two seasons of the competition, finally giving back to the Perth faithful who turn up every week win or lose. Cameron Shepherd, who is having a fantastic tournament, did it for the Force, with a finish in the corner to a courageous fight back by the men from western australia. Try scored, conversion was needed to win it, and Shepherd didn't dissapoint. Emulating Ruan Pienaar the week before, he ignored the pressure of the big moment and kept his head. A great moment for the Force, and any neutral rugby fan. 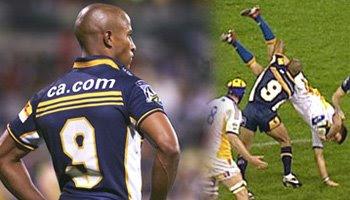 In last years Super 14, George Gregan was suspended for one match following this spear tackle on the Highlanders Richard Kahui. The veteran Aussie was given a yellow card by referee Jonathan Kaplan but was cited after the match for the dangerous tackle. Gregan was perhaps lucky to get away with only a one week suspension considering how dangerous a tackle like this can be. Quite similar to the Lote Tuqiri tackle on Richie McCaw. Still, as wrong as it was, it's still fairly impressive to see a scrumhalf mix it up with the bigger boys. Another week of Super 14 brings with it more fantastic tries, hits, and of course, Percy's. Notably, Odwa Ndungane had one of the most spectacular zero to hero transformations in their game against the Crusaders. And how's the size of that ball boy!!!? "He did it last week,it's gonna happen again!" CJ gets the ball on the halfway line and sprints to score against the Bulls, including a 'sidestep' to beat the last man, who was actually Pedri Wannenburg the huge Bulls number eight. There's been a few great tries scored by Props over the years. 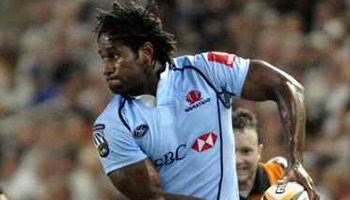 Who could forget Richard Bands against the All Blacks about 2 seasons ago? And then more recently, Greg Holmes for Australia. With time up and the scores tied 16-16, the Waratahs got themselves a penalty on the half way line. Go for posts would have been the obvious choice, and it probably was according to kicker Peter Hewat. Sam Norton-Knight spotted a bit of space and took the risk of a quick tap and dart down the wing, only to be tackled and lose possession, and with it, the game. As you'll see here Tuqiri took exception to his decision, and wasn't afraid to show it. 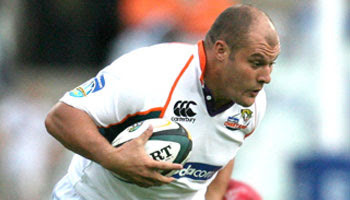 Cheetahs prop CJ van der Linde scores a great try against the Stormers in this years Super 14. Amazing talent and speed for such a big man. Very similar to Os Du Randt in his younger years. The next week against the Bulls, he scored from the halfway line. On Saturday the Sharks took on the Crusaders at Kingspark in a Super 14 encounter that went down to the wire and will be remembered by Sharks fans for all time as we saw an incredible finish. Down by 6 points and with time up on the clock, the Sharks got the ball deep in their own half. To win the game they'd need to score a try against the champion Crusaders, and convert it for the win. They managed to break out from the 22 and through a string of passes, got the ball to Odwa Ndungane who flew in for the try that set up the pressure kick for Ruan Pienaar. After a heart breaking loss to France the previous week in the closing seconds of the match, Ireland had refocused themselves for their second home game of the Championship at Croke Park. It was to be a game of huge physical intensity and high scoring. The French had survived, barely, but for the English there would be no escape. With Irish Rugby's home, Landsdowne Road having been closed for repairs, the union had looked to the Gaelic Athletic Association (G.A.A.) and Croke Park for a temporary venue. To many fans around the world following the Six Nations, such a situation would seem rather ordinary but to the Irish and the English it was a subject of immense tension and deep passion. It had been a bloody Sunday in the November of 1920 that 14 Irish civilians were massacred on this ground by British Security forces in pursuit of a suspected IRA sentry that took refuge in the ground. The football match that was underway was interrupted as confusion broke out amidst the sounds of revolver fire coming from the British Security as they pursued the "IRA sentry" into the ground. Amidst the chaos, 14 civilians were shot dead which subsequently led to the banning of any foreign sports (football and rugby) at Croke Park. In 2007, the doors to Croke Park were opened, once again to Irish Rugby in their 2007 Six Nations season. Emotions ran high amongst the Irish in the both the changing room and the stands as they prepared to deliver their long awaited vengeance unto England. Another excellent weekend of rugby action in the Super 14. Things to look out for in this edition of Plays of the Week - twenty year old Chiefs winger Lelia Masaga's incredible mid air sidestep against the Bulls. Also, Darren Nel's excellent Anti-Percy deserves honourable mention.